Most of our followers know of Jefferson. He’s the steer who made national news when he ran for his life on Jefferson Avenue 15 years ago. On December 2, 2003, Jefferson was transported to the Eastern Market slaughter house in Detroit, Michigan. As he stood in line to be slaughtered, he could smell the stench of death surrounding him and he could hear the painful, anguished cries of the cows in front of him. The line moved forward, one by one, and the cries became louder. Jefferson saw an open doorway. He knew his current path meant death. He chose the open doorway and ran. He ran, not knowing where the doorway led and not knowing if there was anyone to help him, yet he ran. Aided only by his will to live, Jefferson ran for over a mile, while being chased by those who wanted to kill him. News crews followed him, police followed him, animal control followed him, and SASHA Farm Animal Sanctuary supporters followed him. Those same supporters contacted SASHA Farm and asked us to help save this beautiful animal who clearly wanted to live. While living at SASHA Farm Animal Sanctuary, Jefferson’s strong, independent, spirit continued and he thrived. He had his opinion on the human race and his experience told him not to trust us. It took time, but he slowly began accepting the love that was given to him by the SASHA Farm staff, volunteers, and supporters. Jefferson became so comfortable at SASHA that he refused to leave when the cow gate was open. He was content to stay in his pasture while the other cows toured the horse pasture. The cow pasture was green and lush and he wasn’t budging from his happy home. It is with a heavy heart that we are informing you of Jefferson’s passing. Jefferson died on November 17, 2018. He died at his home on the green pasture that he loved so dearly. Jefferson was surrounded by his loving cow family when he died. Immediately after his death, they stood vigil and bellowed in painful anguish. He had a true family who was by his side at death as they were in life. Jefferson is missed by everyone here at SASHA Farm. The founders, staff, and volunteers at SASHA Farm Animal Sanctuary are emotionally impacted with each animal resident death. Every animal death is difficult. We are the humans who feed them, medicate them, clean them, keep them safe and warm, and nurse them back to health when they are ill. We love them. It does not matter if the animal has been a resident for 10 weeks, 10 months, or 10 years. We love them. The founders, staff, and volunteers need time to emotionally process every death. These animals take pieces of our hearts when they leave us, yet we must continue caring for all the other animals. During these times of sorrow, we do our work through tears. SASHA Farm does not announce deaths as quickly as some would like. We cannot and do not because we need time to grieve for our loved ones. Jefferson’s death will surely cause many of our supporters to mourn. We understand. We will mourn with you. There is a beautiful sunrise here at SASHA Farm today. It is a cool, crisp morning and the humans have not left the warmth of their barn yet. I can see them through the holes in their barn, standing with their herd, drinking from a trough small enough to hold with their hooves. They look through those holes often. I think humans like to see the light and beauty that shine in. I do not need holes in my barn to see light and beauty. I feel light and beauty; that feeling surrounds me. The light and beauty in my life are my family, my friends, my caretakers, and my home. I have lived here since I was a calf. I grew big and strong here. I grew my horns here. I do not know fear or pain here. I only know peace, love, kindness, and compassion. This is my home. This is SASHA Farm Animal Sanctuary. My wish for humans in the new year is that you become more like us animal residents of SASHA Farm. Experience the calm that being surrounded by light and beauty gives to you. Realize that animal life, human and non-human, is precious. Feel the peace and love that we feel. Share that peace and love with all animal life. Rejoice daily. Your continued support and generosity have allowed the entire SASHA Farm herd, over 250 of us, to feel love, kindness, compassion, and peace every day of the year. Thank you is all we have to offer so please acceptance our thanks and know that you and your support are meaningful to us. To support Tod and the other SASHA Farm residents, please use our PayPal account. You can send one donation, set up monthly donations, and donate in memory/in honor of a loved one by completing the “Add Special Instructions” section. Every amount, whether one dollar or one thousand dollars, is helpful and will go toward the food and care of all SASHA Farm residents. 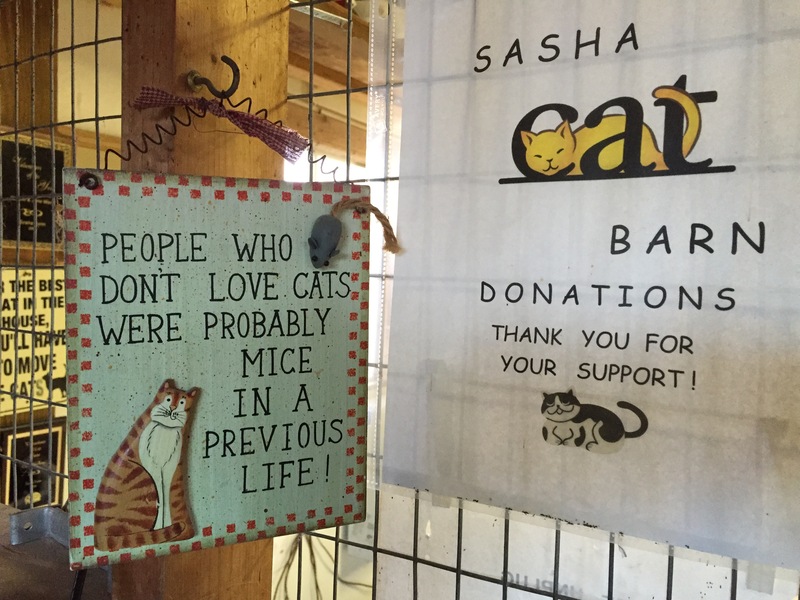 SASHA Farm would love to have your help caring for 12 sweet cats in our cat barn. Shifts are once a week for a minimum of 2 hours, but we would love to have you stay longer! Our volunteers clean, wash floors, do laundry, scoop litter, and feed the cat residents. Purrs and snuggles are complimentary! Please email Darcy at darcyrocks@yahoo.com or Lynn at lynxdonell@aol.com for more information.